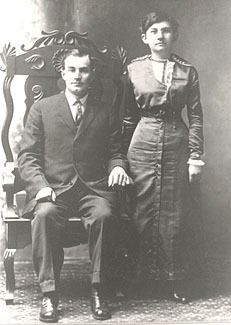 Franklin Marion Sullivan and Clara Ida Noe were married in Marietta, Ohio on November 6, 1912. Clara was born on June 20, 1890 to Louis Noe and Eva Fickeisen. It snowed on her birthday. After Eva and Louis married, they had settled on a farm in Hopewell, West Virginia, not too far from Marietta, Ohio. So Clara spent the Victorian Decade there. She had two older twin sisters, Ella and Nella, but Nella died of a childhood disease. Her father died when she was 14 years old, in 1904, and Eva and Clara returned to the log cabin on the family homestead at Pleasant Ridge in Washington County, Ohio within the year. Eva had some savings from the Hopewell farm and bought the old place along with her brother, Charles, for $1200. She lived there for five years. Eva had grown up on Pleasant Ridge in a family of 6 boys and 6 girls. Her parents had started their family and their married life by immigrating to the New World, following a path across the United States through New York, Northern Pennsylvania and Ohio, West Virginia, and finally Pleasant Ridge. Eva was a young girl when they moved there in 1857. Pleasant ridge contained a German immigrant farming community. According to my mother "The Bartells, the Fickeisens, the Biehls, the Schwartzs, and the Schrams were the main families out on Pleasant Ridge, came and migrated from Germany well before the Civil War I think perhaps the Zimmers were also in this community. These folks worked hard on the farm, had Saturday cotillions and picnics, and went to the Lutheran Church on Sunday. They all read the German Bible." Frank Sullivan was born on March 23,1881. He had vague memories of his Irishman father, David, who left before he was four. David was a riverman and lived and worked on boats. He didn't stay long in one place, including staying with his wife and five children. His mother, Caroline Bartell, who had been born on Pleasant Ridge, had been drawn into this riverboat life through her marriage. When Caroline died, Frank was adopted by her sister, Elizabeth Bartell, and her husband, Jacob Zimmer. Frank grew up in a family of three boys and one girl. When Frank was twelve, his stepbrother Jakie was killed in a tragic farm accident. He and Jakie were out late one night bringing a team of oxen home. Lightning struck, the oxen bolted, and Jakie was thrown to his death. For a time, Jacob and Elizabeth Zimmer blamed Frank, but they eventually forave him. In his teens, presumably, Frank had tilled the soil, cared for the farm animals, pitched hay and harvested crops. Also, somewhere along the way he learned to play the fiddle. While Clara was on Pleasant Ridge, at around age 16, she began to date Frank, who was still living with his adoptive parents on Pleasant Ridge, Jacob Zimmer and Elizabeth Bartell Zimmer. He was nine years her senior. Clara also had trouble deciding what to do with her life. My mom tells me that Grandma Noe found a woman to give her organ lessons, and that she wanted to be the Lutheran Church organist. However, written cryptically in her Lutheran Hymnal is the phrase "First Organist Didn't Play." Mom thinks that somehow either she couldn't learn, or someone else got the job. Her sister, Ella, went to school and became a teacher, but Clara refused to do that.